The Codex Calixtinus is a 12th century illuminated manuscript formerly attributed to Pope Callixtus II, though now believed to have been arranged by the French scholar Aymeric Picaud. The principal author is actually given as ‘Scriptor I’.It was intended as an anthology of background detail and advice for pilgrims following the Way of St. James to the shrine of the apostle Saint James the Great, located in the cathedral of Santiago de Compostela, Galicia. The codex is alternatively known as the Liber Sancti Jacobi, or the Book of Saint James. The collection includes sermons, reports of miracles and liturgical texts associated with Saint James, and a most interesting set of polyphonic musical pìeces. 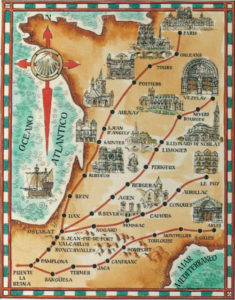 In it are also found descriptions of the route, works of art to be seen along the way, and the customs of the local people.The book disappeared from its security case on the 5th of July of 2011 but recovered by the Police a year later. The origins and authorship of the Codex Calixtinus have been the subject of much debate amongst scholars. It is generally believed to have been written by a number of different authors and then compiled as a single volume, possibly between 1135 and 1139 by the French scholar Aymeric Picaud. It is thought that in order to lend authority to their work, the authors prefaced the book with a forged letter purportedly signed by Pope Callixtus II, who had already died in 1124. The earliest known edition of the codex is that held in the archives of the Cathedral of Santiago de Compostela, and dates from about 1150. It was lost and forgotten for many years until rediscovered in 1886 by the Jesuit scholar Padre Fidel Fita. A copy of the Santiago edition was made in 1173 by the monk Arnaldo de Monte, and is known as The Ripoll (after the monastery of Santa Maria de Ripoll in Catalonia). It is now kept in Barcelona. 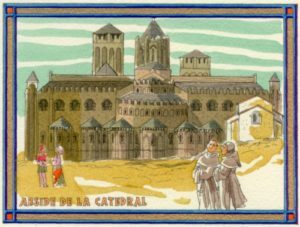 The book was well-received by the Church of Rome, and copies of it were to be found from Rome to Jerusalem, but it was particularly popular at the Abbey of Cluny. 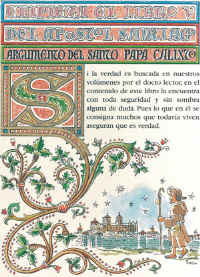 The first full transcription of the Codex was done in 1932 by Walter Muir Whitehill, and published in 1944 in Madrid by the Spanish Consejo Superior de Investigaciones Científicas, together with a musicological study by Silos’s Dom Germán Prado O.S.B., and another on the miniature illustrations by Jesús Carro García. The Santiago de Compostela copy comprises five volumes, totalling 225 double-sided folios each 295 by 214 mm. Its oversized pages were trimmed down during a restoration in 1966. With some exceptions, each folio displays a single column of thirty-four lines of text. Book IV had been torn off in 1609, either by accident, theft or at the decree of King Philip III, and it was reinstated during the restoration.The letter of Pope Callixtus II which opens the book, occupies both recto and verso of the first two folios. The author, who claims to be Callixtus II, tells how he collected many testimonies on the good deeds of Saint James, “traversing the cruel grounds and provinces for fourteen years”. He also describes how the manuscript survived many hazards from fire to drowning. The letter is addressed “to the very holy assembly of the basilica of Cluny” and to “Diego, archbishop of Compostela”. Book I accounts for almost half of all the codex and contains sermons and homilies concerning Saint James, two descriptions of his martyrdom and official liturgies for his veneration. Its relative size and the information it contains on the spiritual aspects of the pilgrimage make it the heart of the codex. The hagiographic Book II is an account of twenty-two miracles across Europe attributed to Saint James, both during his life and after his death. The recipients and witnesses to these miracles are often pilgrims. Liber de translatione corporis sancti Jacobi ad Compostellam. Book III is the briefest of the five books and describes the transfer of Saint James’ body from Jerusalem to his tomb in Galicia. It also tells of the custom started by the first pilgrims of gathering souvenir sea shells from the Galician coast. The scallop shell is a symbol for Saint James. Book IV is attributed to Archbishop Turpín of Reims, although in fact it is the work of an anonymous writer of the 12th century. It describes the coming of Charlemagne to Spain, his defeat at the Battle of Roncevaux Pass and the death of the knight Roland. It relates how Saint James then appeared in a dream to Charlemagne, urging him to liberate his tomb from the Moors and showing him the direction to follow by the route of the Milky Way. This association has given the Milky Way an alternate name in Spain of Camino de Santiago. The chapter also includes an account of Roland’s defeat of the giant Saracen Ferragut.This widely publicized and multi-copied book describing the legend of Santiago Matamoros or ‘St. James the Moorslayer’ is considered by scholars to be an early example of propaganda by the Catholic Church to drum up recruits for the military Order of Santiago. The Order was formed in order to help protect church interests in northern Spain from Moorish invaders. The Military Orders of the Middle Ages were closely associated with the Crusades.In later years the legend became somewhat of an embarrassment in its depiction of Saint James as a bloodthirsty avenger 800 years after his death. King Philip III ordered that Book IV be removed from the codex and for a while it circulated as a separate volume. 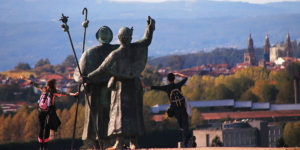 Throughout northern Spain along the Way of St. James known as the Camino Frances, most churches and cathedrals still have statuary and chapels applauding ‘Saint James the Moorslayer’. Today this legend in northern Spain has cultural and historical significance that is completely separate from any of the original intentions by the Catholic Church. Iter pro peregrinis ad Compostellam. Book V is a wealth of practical advice for pilgrims, informing them where they should stop, relics they should venerate, sanctuaries they should visit, and commercial scams and bad food they should be wary of. The book provides a valuable insight into the life of the 12th century pilgrim. 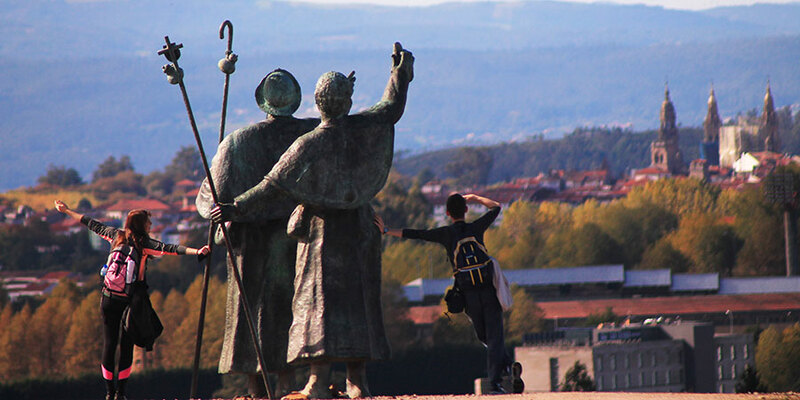 It also describes the city of Santiago de Compostela and its cathedral. The popular appeal of Book V led to it achieving the greatest fame, and it has been described as the first tourist’s guide book. Among Basque scholars, this account is considered as highly important because it contains some of the earliest Basque words and phrases of the post-Roman period.Modern day pilgrims on the Way of St. James visit the same locations that are mentioned in the book, though the accommodations now have electricity and running water. 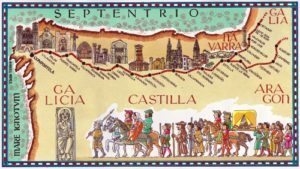 In 1993, UNESCO placed the Spanish section of the pilgrimage on the World Heritage List, describing it as “a testimony to the power of the Christian faith among people of all social classes”. 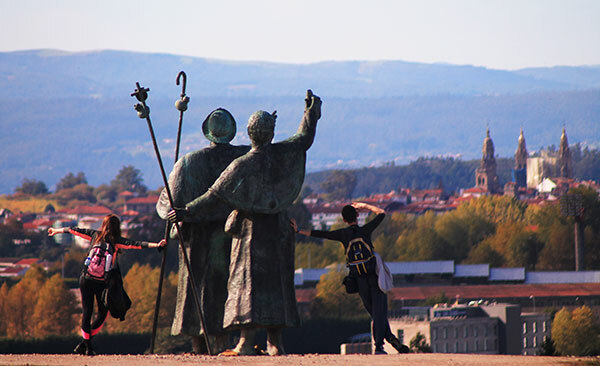 The French section joined the list in 1998 when UNESCO declared the cultural and historical importance of the World Heritage Sites of the Routes of Santiago de Compostela in France. The Codex Calixtinus was intended to be chanted aloud and is of great interest to musicologists as an early example of polyphony. In particular, it contains the first known composition for three voices, the conductus Congaudeant catholici (Let all Catholics rejoice together); however, the extreme dissonance encountered when performing all three voices together has led some scholars to suggest that this was not the original intention. The popularity of the music has continued to the present day with modern recordings commercially available. 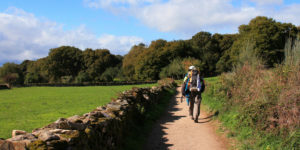 For more information about the Camino de Santiago and all of the tours available please contact one of our Travel Specialists.